Nautel was born out of innovation starting with the invention of the first solid state Navigation Beacon. Four decades later many of those early systems remain in service today. 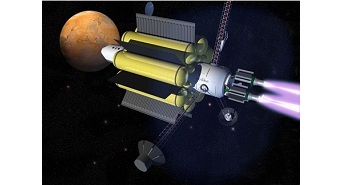 Nautel continues to develop world class Navigation solutions and is even pushing its RF Amplifier expertise into space. That means there is a bit of rocket science in all of our transmitters. It shows in Nautel’s efficient and robust designs that incorporate the latest digital signal control, advanced amplifiers and load matching capabilities. Nautel’s integrated North American manufacturing gives Nautel complete control over all aspects of transmitter design; from our lightweight, corrosion-resistant racks to amplifier design, and even our environmentally-friendly packaging. Two ISO 9001:2008 certified manufacturing facilities, one in Canada and one in the United States feature CNC fabrication shops, light electronic assembly, final assembly and extensive test facilities. A full inventory of parts, modules and subassemblies is available to support your maintenance needs. With an average of 15 years of experience perfecting their craft, Nautel’s production staff provides unparalleled quality and attention to detail. Just one more reason why Nautel transmitters are so reliable. 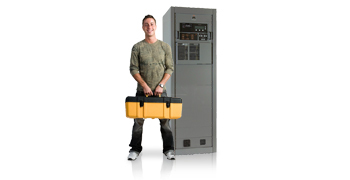 Nautel reliability is why customers have been coming back for more than four decades. From the beginning, every Nautel transmitter has incorporated solid-state components in rugged, highly redundant architectures that perform in harsh climates ranging from arctic, to desert, to jungle. 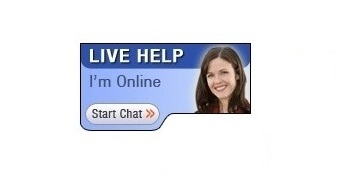 Nautel has never discontinued support for any product, ever. 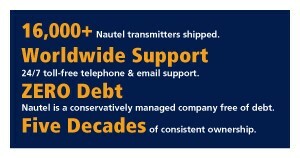 That’s just one reason why Nautel support is renowned in the industry. Another is our drop everything attitude. We know that being on the air is what your business is all about. That’s why in those rare situations when a customer is off the air, we do everything possible to get you back on air quickly. Your transmitter may be called upon for 15, 20 or even more years of service. Like the transmitters we manufacture Nautel is also structured for the long haul. Consistent profitability, stable ownership, community values, and a vibrant yet experienced work environment has helped sustain Nautel through four decades, and positions the company for many more years of service to you our customers.